Hey how was your weekend? This weekend many of my friends heading out of town or overseas for a short vacation. How about you? I am patiently waiting for my next trip, soon very soon… By the way, here is our weekend vibes with Mizzue. We had a pleasant and fun day out with the family doing some shopping and also buka puasa with some ex-colleagues. This new the 'Latanya Dahlquist' bucket-inspired style black shoulder bag from Mizzue is my currently fave. The bag is elegant and roomy enough to store all my essentials for work and play. Adding to it the shining gold-tone turn lock at the front gives a soft touch of luxe to the overall minimalist look. I find that simple and minimalist bag is the most versatile to go with any outfit and accession be it weekend or weekday. Let’s take a closer look at the interior, its divided to 2 spacious compartments and a magnetic snap closure. Each compartment has a slip pocket and zip pocket on the inner wall to store all the smaller items, like car keys, parking tickets and etc. There are a few ways I can carry the shoulder bag, it has a hanging leather-charm, a top handle and an optional shoulder strap, making it the perfect companion for a day out. There are 3 color available such as black, pink and rose. This 'Latanya Dahlquist’ shoulder bag is now available at mizzue Malaysia at mizzue.com.my it’s an online store to satisfy your handbag shopping temptations. Perhaps you're looking for a simple tote or an elegant evening clutch, or maybe your work wear or a pair of heels? At mizzue, there will be something that will hit the spot. I like the pink color design. It match your ootd. 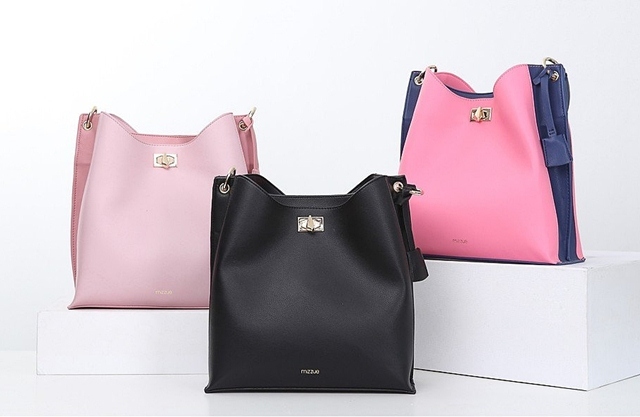 the color of bag suitable for you. I like the style of the bag, I shall visit the web soon. Wahh. I love the combination there. You look so young Kelly.